230v Bodine Synchronous Projector Motors are the cats meow for many projects, not the least of which is replacements for theater projector motors. They achieve and lock in at 1200 rpm.... exactly! When operated in reverse, or when the shaft is driven by a wind propeller, once 1200 rpm is achieved, the voltage and frequency output is constant regardless of small speed variations. Most generators have a transmission to convert prop rotations to generator requirements. 5.5" diameter x 7.5" long body. Type 48Y6BFYP, 1200 rpm, 1/5 hp, 230vac, 3 phase 60Hz, 2.3 amps. Shaft is 5/8" diameter 2-1/2" long. Great for wind generators! Bodine Projector Motors are identical to left but 208v, 3 phase. Great for wind generators! Bodine Projector Motors are physically identical to left but are 1000 rpm, 380v, 1.3 amp, 50 Hz, 1/5 hp 3 phase. Great for wind generators! Xenotech, Inc. 100 foot lighting extension cable. Multi-conductor - Two "00" gauge conductors, Eight 16 gauge conductors. Male & female connectors. Used but in excellent condition!! Ballantyne timer box contains an Omron H3G-8C timer and four 0.5 ohm 50 watt Dale resistors. Plug in timer relay has DPDT, 5 amp contact rating and 120 vac control voltage plus nice octal hard wire base. Dial in any time between 0-5 seconds. 4" high x 5" x 6" Bud CU-729 box with removable top and bottom. Kraus & Naimer Blue Line 600 vac @ 35 amps (up to 25 hp) tap switch is perfect for switching primary taps, motor winding or any application you need the convenience of selecting multiple taps without rewiring. Removable front escutcheon is 3-7/16" square. Switch body is 2-3/16" behind panel. New in the box. Watlow Model 733A-1DA1-AAAR micro-processor controlled, menu driven time / temperature control. Up to 12 menus with time and temperature parameters plus process and deviation alarms. Includes program manual & service manual. New, unused!! ORC / Ballantyne lighting control panel. Includes many useful parts and high quality parts. 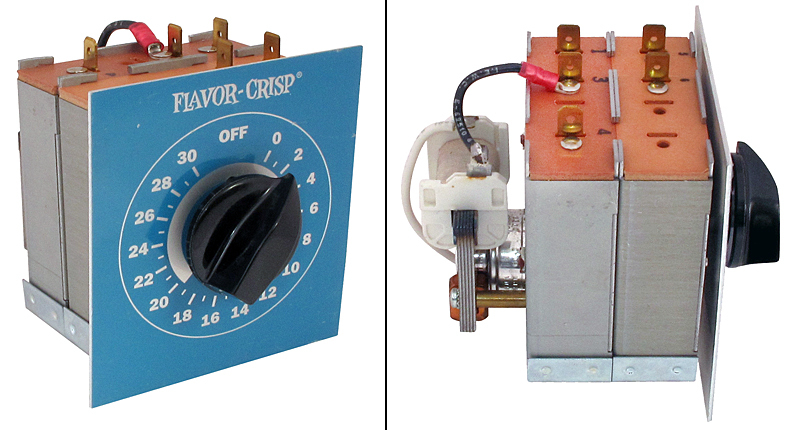 4 circuit breakers including one 3 pole 25 amp(DC3-B0-24-625-13C-C), one 3 pole 15 amp(DC3-B0-24-615-131-C) and two 2 pole 3 amp (DC2-B0-24-430-131-C). Panel Meter 3-1/2" x 3", 1ma full scale, 0-60v and 0-120 amps actual scales. Elapsed time indicator (HOUR METER) 120 vac, 30 ma. Project box. "CNA Booth Termination Cabinet". Excess from Ballantyne theater equipment. New!! Dimensions: 14" x 6" x 3-1/2"
Holiday Manufacturing replacement plastic escutcheon for vacuum tube intercom. Surplus from Ballantyne. Brand new!! "811 Lamp Fail" card. Detection / alarm trigger ckt. 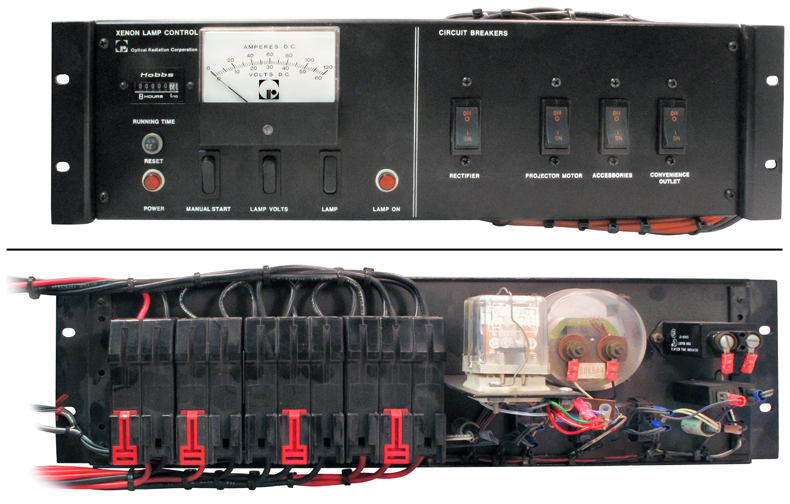 Includes: HB2-DC24V (x3) DPDT socket relay, photo electric eye, indication ckt / with LED. Surplus from Ballantyne. No diagram, no hook-up.